Celebrate Books - Donate a book in honor of your child's birthday! 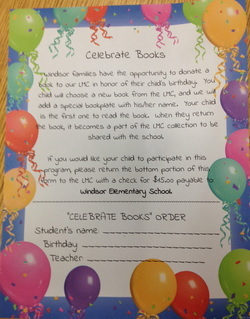 The LMC is excited to offer you an opportunity to honor your child through the donation of a book. We have a selection of books for the children to choose from. They are the first person to read the book before it becomes a part of the LMC book collection. ​Donations are $15 dollars. Checks should be made payable to Windsor School. Thank you for participating in the program. Graham - How Do Cats Purr? Jack - What if you had an Animal Nose?